NEWS 2010: Barker Ranch has burnt down. Most of the stone structures are still in place, but the majority of wood work is now gone. Careless campers are to blame!!! Sometimes graded Goler Canyon Road is 4WD recommended - although most high clearance SUVs can navigate fine. Each season storms can change the wild road drastically, so be prepared for just about anything, including rock slides. Goler Wash runs up the westside of the Panamint Range to Mengel Pass, then drops down into main section of Death Valley National Park. The ranch house might to be in pretty good shape for being in the middle of nowhere. 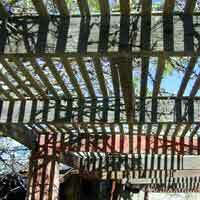 The property is lined with vegetation & an extensive irrigation system is laid. The fruit trees are abundant for being in such a desert enviroment & the pomegranate bush in front sometimes has fruit hanging. 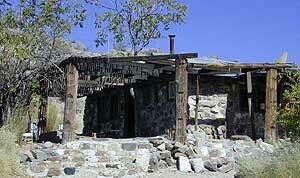 Manson Family it ended here! This notorious place is known as the last hideout of Charlie Manson and his "family" during and after the gruesome LA murder spree. The local county sheriff department & National Park law enforcement captured Manson and his group in 1969. At the time of his arrest, they were unaware of what they had on their hands. They wanted to prosecute the persons responsible for vandalizing a portion of the National Park further north, not even knowing that they had a mass murder suspect, plus a cult following of druggie kids. 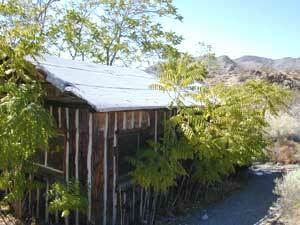 Barker Ranch is located in a rock & boulder filled valley near the top of the desert mountain range, lead to by sandy primitive backroads. Streams feed this little valley and provide much vegetation. 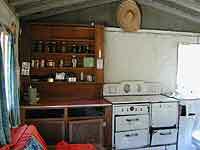 There is a small one-room guest house located to the side of the main house. There is also a primtive style swimming pool made from cement and rock boulders towards the back of the property. There is a gate that should be kept closed. A good map of the dirt back roads is advised (see the one above). 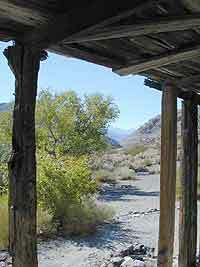 Goler Wash is the main way up to the ranch from the westside, Panamint Valley area. 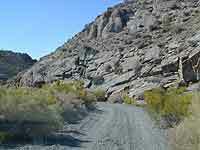 Camping on dirt road in the National Park may be limited to restrictions. 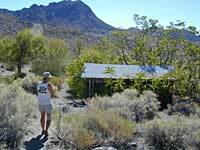 Best spots for primtive road side camping is outside of park boundaries in Panamint Valley. There is plenty wide open areas to camp with RVs. 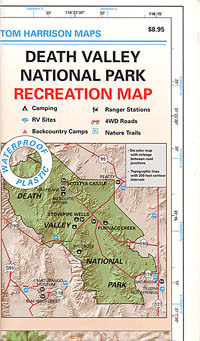 Jeeps will prefer the numerous hidden canyons & camp sites.